Are you on Instagram? Struggling to increase your followers? 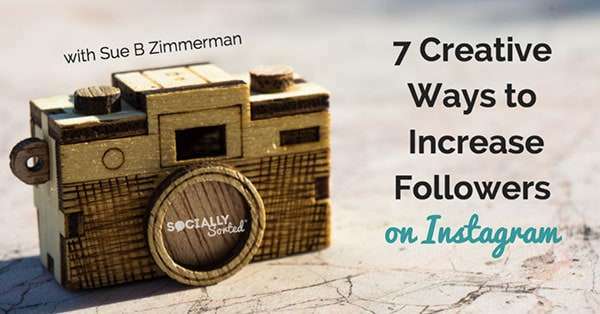 In this post I asked Sue B Zimmerman (the Instagram Expert), to share 7 Creative Ways to Increase your followers on Instagram … the RIGHT way. 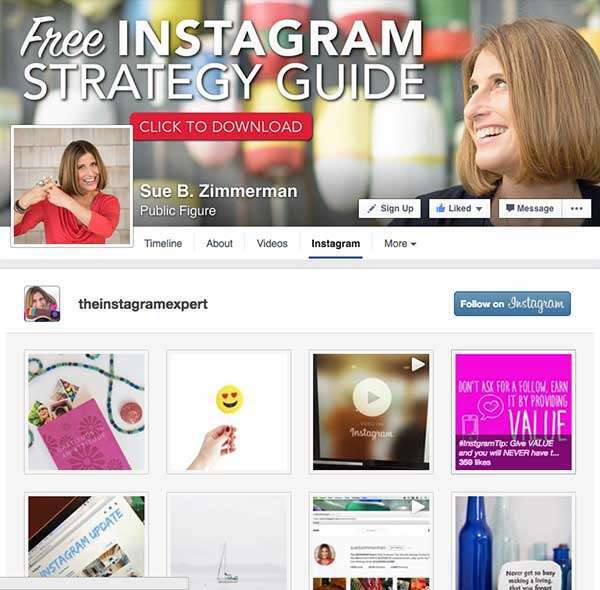 Sue is my Go-To-Gal for Instagram tips, so listen up! It is so important to create a community on Instagram and not just try to get as many followers as possible. More is not always better. The difference between followers and a community is quality. 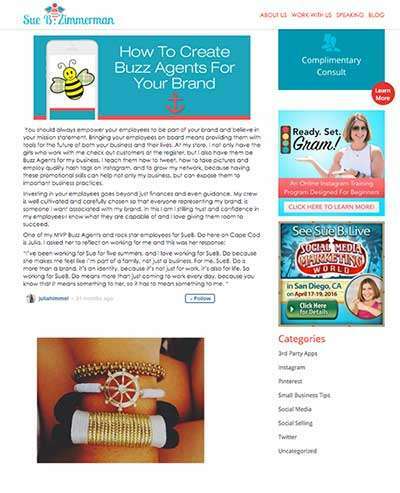 In order to obtain quality new community members, it is a good idea to get creative….. 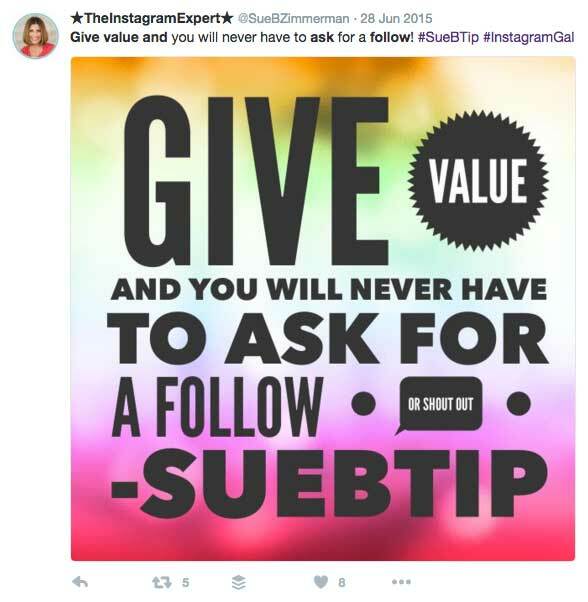 These are my “SueB tricks to increase followers on Instagram”. Make sure to connect your Instagram and Facebook accounts. You can post directly to Facebook through Instagram. 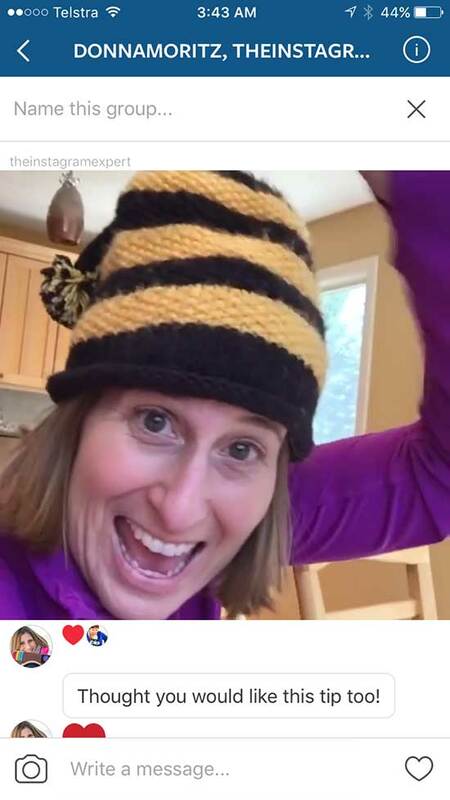 When people see your content coming over from Instagram to Facebook, they will be encouraged to check you out on that platform as well if they like what they are seeing… and of course they will! You can also add a custom tab to your Facebook Page! You create a relationship between the places you and your brand are showing up. There is a consistency and relevancy shining through what you are doing. Time efficiency for you and your team is maximised because you are get double use from your images. Driving traffic to and from your different brand spaces online is how to maximise your greatest efforts. Do not miss the chance to take a connection on a deeper dive so fans can follow you in the place that works best for them. Get the attention of your fans while they are on your website through a noticeable and accessible Instagram widget, so they can easily check you out on Instagram. Make sure to remind your “list” that they should be following you on social media so they can more easily connect with you on the go. This way they will not miss anything you are sharing because often times your content can differ depending on the platform. You can also give them an example of how they can benefit from connecting outside of the newsletter like this example here. It highlights using social to connect in a bigger way at live events or virtual summits. Lots of people are now doing “everything” through Google. Google knows how to do things right so tap into that. Google Hangouts are an amazing newer way to go live with your community through Google Plus, and of course, post on Google Plus as well as posting about your Instagram account on other social media channels. Try it! Why? Because sharing posts natively from Instagram to Twitter means the image won’t show unless you click on it. ITTT is a great tool that allows your Instagram Post to show up as an image in the feed and not as a link. You only have a split second to get a reader’s attention. In Twitter that is hard to do without an image and when news is moving so fast. The ITTT app makes sure your audience sees what you are talking about every time by posting the Instagram image instead of just the link. ITTT shows your images on Twitter… but keep the description short. Use Instagram DM to have a more intimate conversation and relationship with those that are following you! You can send videos or photos via Instagram DM – it’s still not commonly used, so you immediately stand out when you use this strategy. Here’s a screenshot of the video DM I sent Donna about this tip! Use DMs to have a more intimate conversation that stands out! How are you engaging on Instagram and increasing followers? Do you have a creative engagement strategy to share? Leave your comment below! 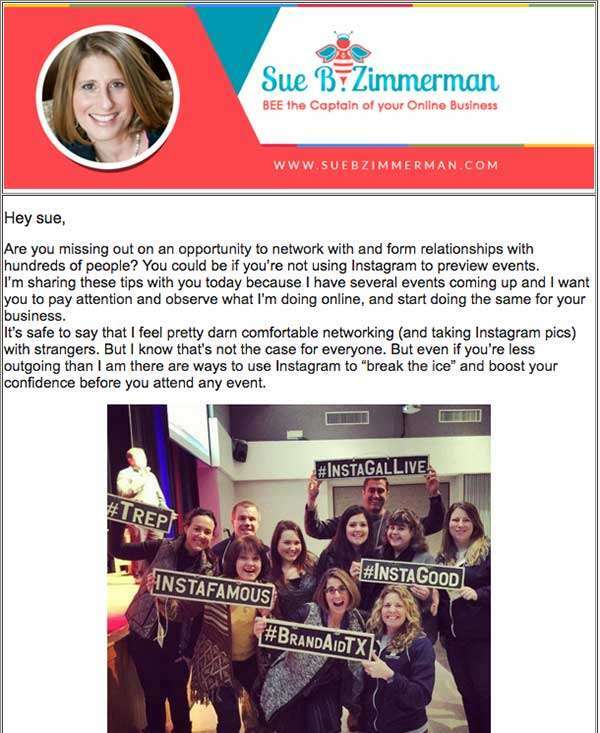 Sue B. is the founder of the online Instagram course Insta-Results, the author of Instagram Basics for your Business, a CreativeLive instructor, a speaker and business coach. She teaches entrepreneurs, business execs, and marketing professionals how to leverage the power of Instagram for real business results. As a serial entrepreneur, Sue B. has started over eighteen businesses, including SueB Do, Boxer Rebellion and Sue B. Zimmerman Enterprise.